StrongVPN is just as strong as its name suggests. It is not overloaded with gimmicks but performs as required. Its anti-censorship tools ensure that it’s under the radar and hence bypassing websites and also unblocking sites like Hulu and Netflix. The company is based in the US. This may seem a downside due to US data laws but what it offers may have you thinking otherwise. Its reliable hosting has virtual private servers, networks and co-location services. The company has been in the industry since 1994; Lots of years of experience. This StrongVPN Review will let you know more about this VPN provider as well as its strengths and weaknesses. There are three packages to choose from with no free trial. To cover for that, StrongVPN offers 5-day money-back guarantee on all of its paid packages. This may not seem like the best tactic to substitute the free trial, but it does the trick. You may wonder why the plans are offering the same services. The difference comes in regarding the prices. The 12 months’ package is very cheap compared to the 1 month plan. The pricing and plans are summarized as shown below. Other third party payment options such as PayPal and Alipay are also allowed. If you like to maintain your anonymity, StrongVPN offers Bitcoin, the ultimate anonymous digital currency. If you are not satisfied with their services, you have a grace period of 5 days to request your money back. Strong VPN has over 500 servers in 46 cities in 24 countries. These servers are responsible for offering high-speed connections to the users. The servers are spread out in the 24 countries. As seen, most of the servers are located in the US and the United Kingdom. Strong VPN has robust features that have gained it a good reputation. The paramount features include its security protocols and encryptions. As part of this, it offers Strong DNS across its packages. Strong DNS is used to allow access to blocked websites. It substitutes their DNSs to those of countries that are not restricted. As part of its advanced security, StrongVPN offers a lot of protocols that easily match any other VPN service provider. This protocols include; PPTP, L2TP, SSTP, OpenVPN and IPSec Protocols. Like other VPN providers, they also recommend the use of the OpenVPN protocol as it is the most secure of all protocols. PPTP is only used at certain circumstances as it is vulnerable to security threats. The other protocols; L2TP and SSTP provide security as equal to the OpenVPN. This protocols are backed up by military grade encryption; the 2048-bit AES encryption. This encryption has a good reputation for having never been cracked easily and therefore you can be sure of your online security. To further enhance security, StrongVPN has somehow managed to use shared dynamic IP addresses –traffic from one customer is mixed with traffic from other customers – for its customers, and this increases anonymity and security as they will be harder to track. Another important security feature is the Kill Switch. This feature is useful in disabling your data traffic when your VPN connection drops. This is helpful for insecure WIFI networks and also torrents. As part of the service there is an option that obscures traffics and makes it look like normal traffic in the eyes of anti-VPN firewalls. There’s also a port list that can be edited to suit your preference. Server switching is allowed but with some restrictions. It doesn’t allow users to switch across its servers freely. These restrictions are based on the packages that you have subscribed to. Switching freely comes at a price. There are certain restrictions on the switches that you can make in a month. This VPN provider does not allow users to freely jump between its 500+ servers. There is a cap on the number of switches that be made between different servers in a given month. NOTE: They don’t support blackberry. These systems are backed up by email. The FAQ knowledge base contains solutions to common and frequent problems. You can also use the live chat for quick fixes, and the ticket support for more technical matters. They also have agents at their support desk that are available 24x7x365. The StrongVPN website also features a forum and a blog. The forum explains everything about Strong VPN. It also hints on how the StrongVPN routers work. The blog offers updates and other necessary news that the VPN provider deems necessary for you. Before using a VPN, most users opt to use a trial and decide whether it fits their needs. This gives users the best opportunity to test the features offered by the VPN provider and attest they are as good as they are said to be. Strong VPN is a bit different from other VPN providers. It doesn’t offer a free trial. Instead, it has a 5-day money back guarantee on its packages. The five days serve as a trial period. Most users don’t like this idea as it involves payments. Any tests can be done within the five days, and if the service is good, you can continue to use the VPN. Otherwise you may just cancel your subscription and the provider will refund you whatever you paid. Apart from security and privacy, speed is the most considered element when it comes to VPNs. The more the speed, the better. StrongVPN has a reputation when it comes to speed. Unlike other VPNs, its speed doesn’t drop much as tested across its servers. A speed test conducted using Speedtest.net before and after use of StrongVPN revealed the impressive speeds. Different restricted sites that were accessible by Strong VPN such as streaming sites i.e. Hulu and Netflix were also tested. The speeds were incredible as they were fast with no buffering. To use the client, you need to first join one of the plans so that you can have an email and a password that you can use to log in. 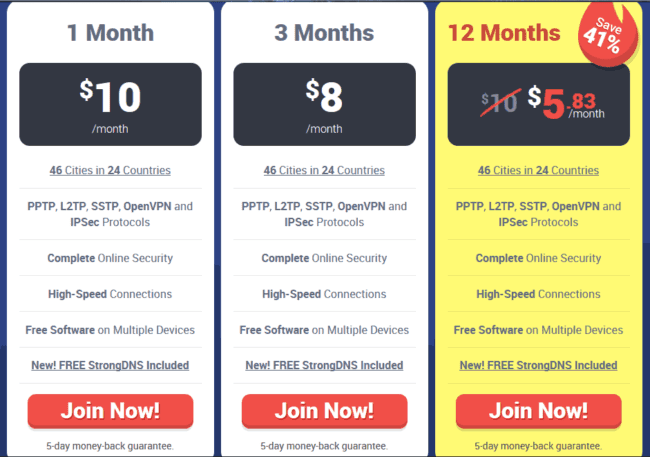 Joining Strong VPN is fast and easy. You can click the ‘Join Now’ button on the official website, as shown above. You will then be able to create a username and password. After that, you can download the client to your platform from the setup section or the bottom part of the StrongVPN website. After a successful StrongVPN download, install the client and log in using your credentials. You will be authenticated and then logged in. 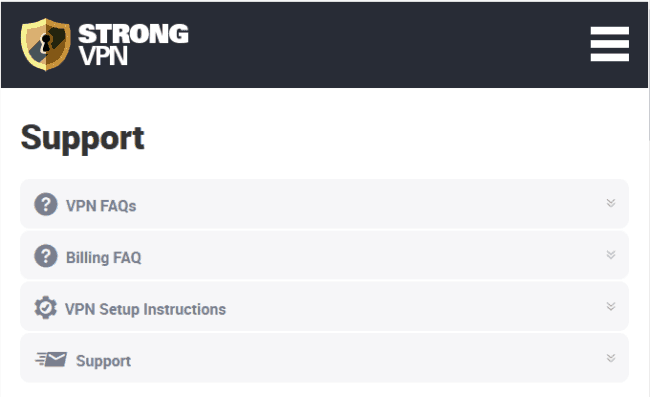 StrongVPN has an intuitive well-designed interface. It sports drop down menus that allows the user choose how the VPN will connect. This includes; a server, location and a protocol to use. StrongVPN is one of the best VPN for streaming blocked content such as Hulu and US Netflix and also to bypass censorships such as those of the Great Firewall in China. It has incredible speeds with top notch security. The Kill Switch and the scramble feature makes this VPN a must have. The Bitcoin payment method is also great for anonymity. The major downside is that it is located in the US and US has put in place powerful laws regarding data and one can be surveilled without knowing. It also logs some of the user’s information. Generally, StrongVPN is ideal to help you in accessing blocked sites, the dark web and also great for Bittorrent download. Your trusted source for the VPN Reviews, Kodi VPN and Internet Privacy Tutorials. Enjoy our comprehensive guides and free tools (Web Proxy, DNS Leak Test) to ensure your internet connection is Safe, Private and Secure. Anonymster compares the Best VPN on the market and offers unbiased reviews of their service. We explain how to protect your online privacy and have a safe experience online. Our team has tested more than 50 VPN and more are soon to come. Every month, we update our tests to keep you up to date. Based on the test results, we decide which ones are the Best VPN providers. Disclosure: We receives compensation from some of the VPN we review. We are independently owned and the opinions expressed here are our own.